Lip chics offer almost everything I look for in a lipstick--they are pigmented, moisturizing, and have a slightly glossy, wet-looking finish. Tea Rose is one of the most popular shades in this line, and I can easily understand why--it's a flattering rosey 'my lips but better shade'. I encountered many gorgeous lip products over the past year, but this makes my best of list because it can be worn everyday, by almost anyone! Not to mention the fact that the gunmental packaging looks so chic! $35.00 at Chantecaille.com. Becca is an underrated brand that has flown under the radar for many years, but with its recent return to Sephora, it is posed to make an impact in 2013. The Shimmering Skin Perfectors are available in four different shades to suit a range of skintones. After hearing rave reviews of this product for a number of years (English makeup artist and youtuber Lisa Eldridge is a big fan), I decided to pick up moonstone. Moonstone leaves a subtle pale golden luminescence to the skin and is hands-down the most beautiful highlighter I have ever use. The shimmer is so refined and subtle, it really does make the skin look like it is glowing from within. These can be used as highlighters or mixed in with foundation for an all over glow. $41.00 at BeccaCosmetics.com. YSL Rouge Pur Couture Vernis à Levres Glossy Stains took the beauty market by storm this year, already inspiring a number of knockoffs. Glossy stains are one of the most innovative products in recent memory, combing a lipstain with a lipgloss. YSL recommends putting on two layers of the product to achieve the full affect, which is a highly pigmented lipgloss that fades evenly down to a stain. I reviewed two of the original glossy stains here (in #5 Rouge Vintage and #12 Corail Fauve) and have since added another three to my collection, #15 Rose Vinyl, #23 Fuschia Cubiste and #13 Rose Tempura. Application takes a bit longer and requires slightly more attention to detail than a traditional lip gloss, but these products are must haves for any gloss lover! 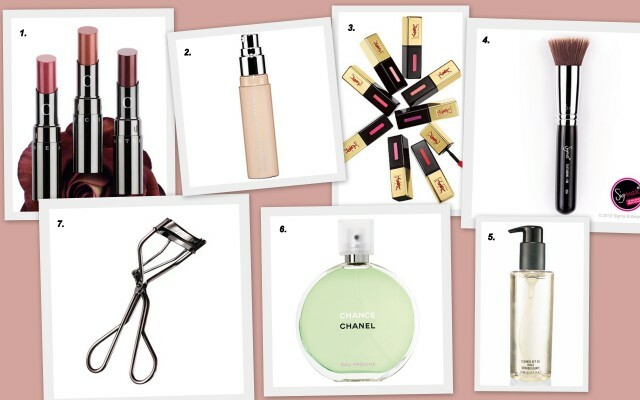 $32.00 at YSLBeautyUS.com (who also offer free complementary shipping). Using an oil for make up removal seems like a counter intuitive idea for someone with oily skin, such as myself. But oils have increased in popularity in a big way this year, as people have recognized how many wonderful properties oils have and that they shouldn't be feared! I use MAC Cleanse Off Oil as part of my nightly routine. I squirt two pumps into my hands and proceed to rub it in all over my face (including my eyes--it is gentle enough to have never caused me any problems). It does a great job of breaking down all of my makeup, so that my next step (my cleanser) can focus on doing the job of getting into my pores and cleansing my skin. Lots of brands make versions of this product, including Boscia, NARS, and DHC--depending on your skin, one may work better for you, so it's worth experimenting a bit with these! $28.00 for 100mL at MACCosmetics.com. This was my go-to fragrance this summer (I used it almost exclusively all summer and worked through over half the bottle). Part of the Chanel Chance family, which includes the classic scent and Chance Eau Tendre, this scent is apparently limited edition, but does not seem to be going anywhere soon. The scent is floral, yet fresh and slightly woody, with notes of citrus, water hyacinth, jasmine, amber and vetiver. I've put away the bottle for the winter months, when I prefer 'heavier' scents, but I will most certainly be spritzing myself with Chanel Chance Eau Fraîche come this spring! It is a perfect everyday scent. $90.00 for 100 mL at Chanel.com. This eyelash curler was probably the single biggest revelation of my year! I've used an eyelash curler on a daily basis for as long as I can remember, but I had always stuck to versions by Revlon or Sephora. Never being completely satisfied with my existing curler, after doing a bit of research online I decided to try the Shiseido eyelash curler, which I'd been told would fit my eye shape (small, hooded, not very curved) the best. Immediately, I noticed a huge difference--the Shiseido fit my eye like no other eyelash curler I had ever tried did. It doesn't pinch and gives a beautiful curl to the lashes every time. And I'm not the only one to notice the difference--a good friend of mine asked me one day if I was wearing false lashes (I wasn't) because my lashes looked so good! I was wearing the same mascara that I had been wearing for months at that point, the only difference was the Shiseido curler. If that's not an endorsement, I don't know what is! $19.00 at Shiseido.com. What were your favorite products of 2012? Follow me on twitter (@julesssdarling) for updates, photos, and general nonsense!